I love rainbows. I love the promise they hold, the beauty of them, and the fresh smell of rain that is usually in the air when I see one. 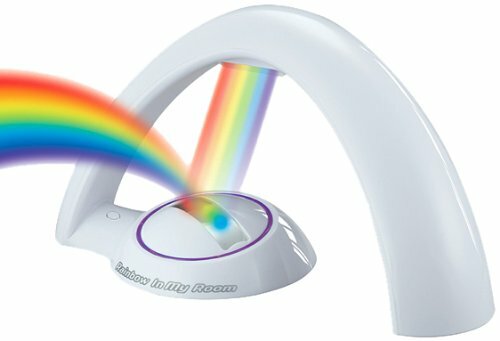 When I was a child, I remember pretending trying to find the pot of gold at the end of a rainbow. I would set about on my mission but no matter how much I walked, I was never able to get any closer to the rainbow. I still hold a fascination to rainbows. Whenever any of us sees one, we all run to the window to check it out. Perhaps some of the attraction to rainbows is that they are a sight that isn’t seen often. It’s even more special when a full rainbow is in view across the horizon. When our daughter saw Uncle Milton’s “Rainbow In My Room” over a year ago, she fell in love. It was the only thing on her Christmas list. (Sadly, I understood that another family member was going to get it for her so we didn’t and she ended up not getting one.) So I was extremely happy to partner with Uncle Milton when they agreed to send a Rainbow In My Room. 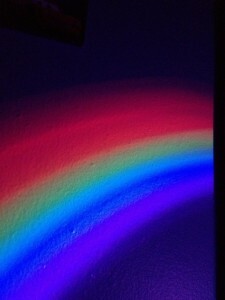 The Rainbow In My Room shines a beautiful rainbow on the wall and ceiling of the room. While the stock photo makes it look like it shines across the room, it does not. It only reflects onto hard surfaces. Is this a problem? Absolutely not. The kids love it! While I, personally, had expected the rainbow to be brighter, the kids don’t mind. They enjoy falling asleep under the beautiful faint colors of Rainbow In My Room. Because we have only had this for a short time, I don’t know how long a set of batteries will last. I did stop at the store to buy an AC adapter so it wouldn’t be an issue but they told me I had to get one online, which I do plan to do. I like that it automatically shuts itself off which should help save battery life until I get the adapter. There are two modes but the kids always choose the immediate full rainbow mode each time. Overall, we really like the Rainbow In My Room. There was no set up except to put in 4 AAA batteries, which our 6 year old son was able to do. While I would like to see a slightly smaller price point, it retails for $29.99, I don’t think it’s outrageous either as I would have paid it last year had I known our daughter wouldn’t be receiving it from another person. Uncle Milton also carries a variety of other really neat looking products. If you are on the search to find a unique gift, Uncle Milton has you covered: Fireworks Lightshow In My Room, Wild Walls Shark Encounter, Under The Sea Journey (Little Mermaid), Fire and Ice Volcano, T-Rexcavator, and so much more. We have also owned the “Moon In My Room” for a year and a half. We have it hanging on the wall in the boy’s room. 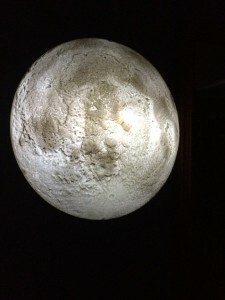 It’s really neat because it has several different options for how full of a moon you want lit. I like that it’s run by a small handheld remote so our 6 year old turns it on from his bed. 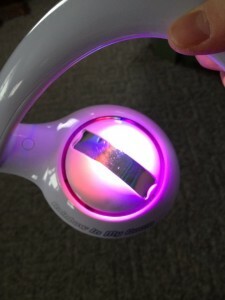 The boys use it for a nightlight and it’s the perfect amount of light for them. Buy It: Head over to Uncle Milton to see for yourself the great selection of products they offer. Connect: Don’t forget to like Uncle Milton on Facebook, follow them on Twitter and Pinterest, and subscribe to their YouTube Channel for all the latest news and promotions. 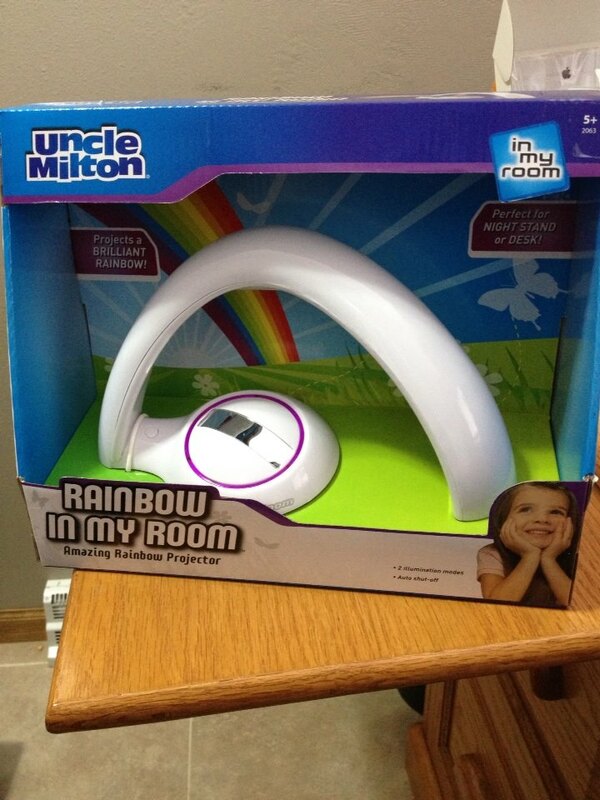 Win It: Uncle Milton is generously offering one of our lucky readers their very own “Rainbow In My Room”. The giveaway is open to US and Canada and will end December 22nd, 2013. For your chance to win, enter the Giveaway Tools below. Good luck! I like the Dream Fairy Room Light. I really like the Ant Farm Revolution. Thank you for the super giveaway opportunity. Keep up the terrific blogging.